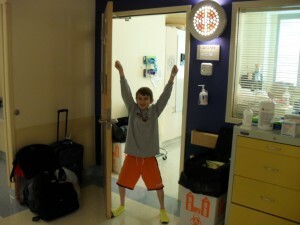 Joshua's NIH Adventure » Blog Archive » Free at Last! « WE ARE OUTTA HERE!!! This entry was posted on Monday, June 14th, 2010 at 10:43 pm	and is filed under Comments. You can follow any responses to this entry through the RSS 2.0 feed. You can leave a response, or trackback from your own site. JOSH!!! FREEDOM!!! Healing!!! You and God both amaze me!! Well done young man! We are all so proud of you and I can’t wait to hear all you will share about this experience. What a great young man you are Josh. I’m proud to know you! With much love, prayer and many blessings for a fun and fantastic future looking out for your little brother! It was so cool seeing you break free! Whoowwwoo – It made me tear up as I can just imagine how you felt walking out and then going outside – Wow that must have been something to feel wind and smell the air again. Thank you for allowing us to go with you on your journey – You are AMAZING and I am so very happy for you!!! Your courage and outlook on life is very contagious. God’s presence is all over you and I am so looking forward to seeing you! Great Escape, Josh! You won’t need to work on that underground tunnel you’ve been digging anymore! Glad to have you Free, home long enough to pet those cats, and now off w/your Dad for some more adventures. See you around your deck & grill sometime this summer! Thank you to Jesus for giving you the grace to be in that room for 81 days. Your attitude was amazing. I love you so much and my prayer is that all the days of your life you’ll walk in the freedom that God has for you. I’m sooo happy that you were able to go on your trip with Dad and Spencer to celebrate…..you deserve it so much. Have a blast! Words can’t explain how blessed I feel to have you for my son.